Illogiblog - The Illogicopedia weblog: Joyous Commercial Conformity Period, comrades! A quick glance over at our home-printed calendar --the one with a faded picture of the dog with a Santa hat (damn my ailing 1996 dot matrix printer)-- tells me it's Christmas Eve. 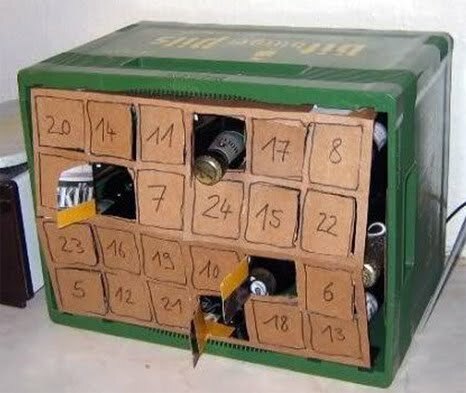 My alternative advent calendar (pictured right, photo taken some three weeks ago) was exhausted on 2 December, so I have been unable to keep track of time effectively for quite a while now. Admittedly, this is mostly because I have been drunk for the best part of four weeks. Which reminds me, let me know anything, anything at all, that happened during the period 27 November-23 December, for I seem to have misplaced my grandfather clock. Right, I'm off to do important stuff, like buy some reeeally last-minute presents from the petrol station, because I know none of you will actually be reading this message on 24 December. You'll be tucked up in bed waiting for some bloke with severe insantaty to throw himself down your chimney so you can knee him in the gonads, of course! So to all a good night, and remember to spare a moment and think about the true meaning of Christmas... the presents. My goodness, the presents! Merry Christmas.